The Big Game is right around the corner and we’ve got you covered. From delicious mini sandwiches to hot and steamy chicken dip, your taste-buds will be cheering as loud as the fans. 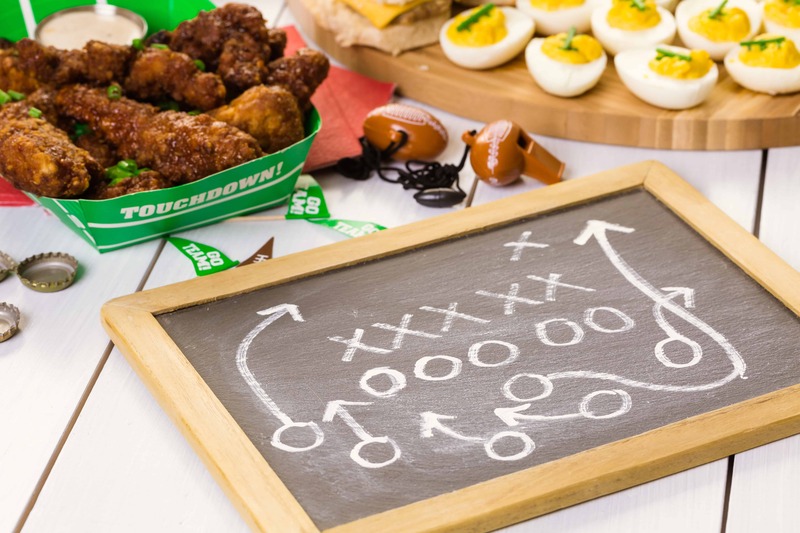 Blow your guests away with our top-scoring tailgate snacks below. Head over to your local Braum’s Fresh Market to get all the ingredients (might as well pick up your favorite ice cream scoop while you are there). Next, grab your apron, game-face, spirit and get to cooking! Sandwich lovers rejoice, this first dish creates flavors that will have you rooting on both teams! Place the bottom halves of the rolls in a 9×13 pan. In a small bowl, combine the cream cheese and chives. Mix until well combined and set aside. Place equal amounts of ham on each roll bottom. Top with shredded cheddar cheese. Spread a generous amount of the cream cheese and chive mixture on the roll tops. Place on top of the ham and cheese. Mix together the butter, Worcestershire sauce, grated onion and minced garlic. Pour over sandwiches and let sit for at least 20 minutes. You can make these ahead of time and allow them to sit in the refrigerator overnight. Place sandwiches, covered in foil, into a preheated 350 degree oven. Bake for 20 minutes or until cheese is melted. Next up on the lineup is a gluten-free sweet treat! Preheat oven to 350 degrees. Spray an 8-inch casserole pan with non-stick cooking spray. Place donut pieces in the baking dish. In a medium-sized bowl, whisk together the eggs, half and half, sugar and vanilla. Pour the egg mixture over the donut pieces. Allow to sit for 15 minutes. Place into hot oven and bake for 40-45 minutes. Remove from oven and drizzle with caramel topping. Winner, winner, chicken dip dinner. The flavor in this dish is sure to please and it’s one of the easiest to make! Preheat the oven to 350 degrees. Coat a 9×9 baking dish with nonstick cooking spray. In a bowl, combine the cream cheese, blue cheese dressing and crumbles, Mexican Blend cheese, hot pepper sauce, and chopped chicken. Stir well until all ingredients are combined. Pour the chicken mixture into the prepared dish. Sprinkle with Colby Jack cheese and bake for 30 minutes or until bubbly. Serve with chips, crackers, and vegetables. Now that you’ve wrapped up the cooking, sit back, relax, and enjoy the game (or commercials). Don’t forget to stop by Braum’s for a celebratory dessert after all is said and done, or grab a few containers of Braum’s ice cream for a celebratory treat. Check out more sweet ideas for dessert on our recipes page.